Hands on: Huawei P30 Pro review | What Hi-Fi? The Huawei P30 series of smartphones has just been unveiled at its launch event in Paris, but we managed to spend some time with it a few weeks ago in Amsterdam. The inspiration behind choosing the Dutch capital for our first look at the handset was one of its most famous former residents, Rembrandt Harmenszoon van Rijn. The master painter is celebrated for his use of light, and that is a driving force behind this camera-focused smartphone, where a Leica quad camera, an innovative alternative to the RGGB Bayer filter and some astounding zoom capabilities are among the headlines. The Chinese manufacturer has set about making the P30 Pro, which operates on the company’s Kirin 980 chipset, the best smartphone available for photos and video. The handset is kitted out with Huawei’s 40MP Superspectrum lens, a 20MP ultra wide angle lens, an 8MP periscope zoom lens with 5x optical zoom, a Time of Flight lens depth of field and a 32MP front camera for selfies. That 5x optical zoom is extended by a hybrid zoom capable of 30x magnification, and up to 50x using the digital zoom; macro photos can also be taken from a minimum distance of 2.5cm. Aiming for more than greater detail, however, Huawei has followed its mantra of “willingness to change and innovate” by scrapping the RGGB Bayer filter and introducing yellow to its palette instead of green. This allows for greater brightness and command of darker scenes. As such, the ISO, which denotes light intensity, is up from 102400 in the P20 Pro – which already matched certain DSLR cameras – to 409600 in the P30 Pro, making it the highest-ever light intensity on a smartphone. Video, meanwhile, is taken in 4K at 30 frames per second, while Huawei also promises better stabilisation and an upturn in low-light capturing. 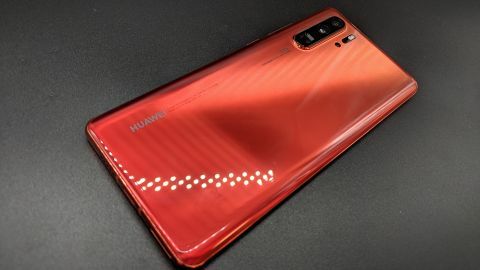 Artificial intelligence has also long been a key component in Huawei’s smartphone design: the P30 phones make use of AIHDR+, whereby the camera surveys a picture for light and can decide where more is necessary rather than brightening the whole image. The Time of Flight, meanwhile, gives a real-time understanding of depth for bokeh effect. Though you may want to view your images and videos elsewhere to witness them in their full glory – there are no 4K screens here – you will have a decent amount of screen to view them on: the P30 Pro features a 6.47in curved OLED screen. Camera quality is certainly the focus with the P30 series, but fans of 3.5mm aux connections will rejoice at finding one on the regular version, though the P30 Pro has only USB Type-C for those uninterested in using the aptX HD Bluetooth. Regardless, you should be able to get through your morning commute and then some: the P30 Pro has a 4200mAh battery, which Huawei claims will facilitate two whole days of basic use, reduced by half for intensive usage. Super charge will also take you from flat to 70 per cent in 30 minutes, while wireless quick charge and reverse charge serve those for whom cables are a thing of the past. Because the back matters to many as much as what’s on the screen, Huawei offers five colour finishes. Alongside a basic Black, there is also Pearl White, Breathing Crystal (light blue), Amber Sunrise (orange) and Aurora (blue-green, based on the Northern Lights). The P30 Pro is available from €999 in 8GB/128GB, 256GB and 512GB options – so no excuses for not filling it up with photos. Huawei has been keen to highlight the P30 Pro’s potential as a tool for professional photographers, but mostly its focus is on letting even amateur snappers, such as ourselves, capture images you might assume were taken on a traditional DSLR camera. Certainly in part that is the case. While often it takes a while to steady and focus – you’ll ruin photos by moving the phone too quickly after snapping – many of the pictures we take, both inside the briefing room and along Amsterdam’s canals, are of a quality beyond which we usually manage. All that zoom is impressive as well. By the time you get to get to 40x or 50x you’ll notice a fair bit of processing in the image, but there remains great detail in an almost-better-than-the-naked-eye kind of fashion. That is a bit of a theme, however. Those software-enhanced low-light photos, where detail is picked out in a near pitch-black room, are impressive, but a part of us wonders why you’d want a photo of how something wasn’t, rather than was. Still, a useful tool for ghost hunters, we imagine. Huawei is also yet to blow us away with the sonic aptitude of its smartphones, but the P30 Pro seems to be as easy a listen as its predecessors. We’ll get a proper idea of how well it handles music and film when we get a device for more rigorous testing, but on first listen the balance feels about right with no rough edges and enough enthusiasm at least for casual listening. Of course, while the P30 series are being sold as camera phones, the majority of their use should be for watching videos and listening to music on the daily commute. Unfortunately, with the P30 Pro being very much under wraps when we saw it, the handsets weren’t connected to the internet. We did however manage to connect to rather slow wi-fi and stream a bit of Netflix. While this was showing nowhere near the handset’s true capability, given the speed and bandwidth available, we did see enough detail and depth to suggest you won’t have any problems watching TV on the train when the P30 Pro is connected to 4G or better wi-fi. We can’t ignore that the P30 series’ main aim is to help people take better photographs – and in that sense casual snappers are in a good place to say it does that pretty well – but it also intends to be a smartphone among the frontrunners in every regard. While we’re unable to vouch for that just yet, first impressions are that it won’t be a million miles off.